Now handles server names with spaces properly. Now handles the first 4 released allied races properly. Fixed issue on realms that are not connected to other realms. Fixed issue on realms with hyphens on their names that caused other characters not to be browsable. Fixed multiple issues with character specific settings. Reset the character specific settings that were screwed up by the previous version. Fixed a bug in the owner list that appeared when BagnonGuildBank_ was disabled. Fixed issue with deleting owner information. Fixed an issue when depositing items in the bank. Fixed an issue with the owner icon generator. Added back :GetItem API function of item buttons for legacy purposes (plugin support). Another major internal update! Completly reworked the internal system for representing item data. The previous system, although more memory efficient, suffered from many problems. It would easly break with updates of the game. It required constant re-specification, making developing and maintaining plugins for other developers much harder. More importantly, the previous system was designed before the advent of Guild Banks. These were considered a set of bags controlled by the player character, which led to a whole set of issues. In the new system, this is no longer the case. Guilds are now considered independent entities from player characters, and the Guild Bank is owned by the Guild. Due to the above, issues from having multiple characters on the same guild are now fixed. Guilds your characters belong to are now listed in the onwer selection dropdown. Selecting them will open the Guild Bank of that Guild. Choosing to open the Guild Bank of a player behaves the same as selecting his/hers Guild in the owner selection dropdown. Tooltip counts now display icons for each owner, just as in the selection dropdown. Fixed an issue with the tooltip displaying characters' money. The money tooltip now uses the standard money icons (except in colorblind mode). Updated internal library (AceEvent) that reportedly was causing problems and preventing the program to load for users running other specific addons. Pressing enter now properly closes the search bars. Fixed issue causing the search not to start when double clicking the frame titles. Hopefully fixed issue causing multiple tries being sometimes required to open/close frames. The Frame Layer setting is now working as properly. Fixed bug preventing separate reagent Bank option from working. Pressing escape on a search editbox now properly disables item searching. Added a localized thousands separator to money display (large gold amounts are now easier to read). Guild Bank now fully functional again. Clicking on the money display while viewing another character will no longer pick money from your current one. Fixed visual issue with right-clicking title to toggle search frame. Fixed visual bugs with the money display and character icon when switching characters. Void Storage now fully functional again. Next update will bring the Guild Bank back. Minor quality of life improvements to some UI elements hitboxes. Added an API for registering item rulesets. Has no visible effect yet. Fixed issue displaying Void Storage tooltips. Fixed issue with new build pipeline versioning system. Updated for WoW patch 7.1. Removed some unused library files from build. Fixed issue with server names with spaces. Fixed issue causing compare tooltips to anchor on the wrong side of the main one. Fixed issue with containers inside containers. Fixed issue with displaying information about characters on the same server. Hopefully fixed issue with Guild Bank tabs in Legion (can't test yet). Fixed issue with character and realm detection. Fixed bug that caused errors when searching items with a few special characters. Fixed bug when moving empty bag to inventory. Bagnon will now fill existing item stacks in the Bank bags before filling an empty slot in the reagent Bank. Localization updates. Thank you Phanx! Can now search for "naval" items. Fixed issue causing money display to not update when switching characters. Improved class color readability in tooltips and menus. Fixed minor bug in the Guild log frames. Major item draw performance improvement. When enabling character specific settings, they are initialized as a copy of the current global settings. Now frame settings can be saved per character or shared between characters, depending on the user preferences. You can choose wether to use the global settings on each different character. Look at the frame settings panel. By default, new characters will use the global options. Characters upgrading from previous versions will have specific settings. Fixed issue affecting some users that caused the frame to require being open twice to appear. Fixed issue causing frame to appear empty on first appearance. Fixed issue preventing control click items to preview them. Flipped clean up button behaviour back to what it was before patch 6.1. Fixed issue with the "Display Blizzard Bags" feature. Last version appears to be a success. Applied same process to Vault and Guild Bank. Fixed an interference issue between Bank, Guild Bank and Vault frames. Display options that have no effect in specific frames are no longer displayed. Attempt to fix the "unresponsive Bank" issue that affects some users. Fixed issue with Guild Bank repostioning. Fixed issue with slot color. Added option to change frames strata. GuildBank and voidstorage are now properly shown in row order. Blizzard frames for disabled bags option is now functional. Added keybindings and slashcommands for all windows. This is an experimental version. Use at your own risk. If you find a bug and report it, please indicate that you are using this version. Added option to have the reagent Bank separated from the normal Bank bags. Bagnon databroker plugin now displays number of free slots in inventory. You may now set the transparency of the frames background and borders. Fixed major bugs reported so far. Added "Reverse Bag Order" option. While Bagnon might look the same, the great majority of the code has been written from scratch. These changes should provide better performance and make future development and debugging much faster. "Script ran for too Long" errors should become much less frequent. This also increases the amount of code shared between Bagnon and Combuctor, allowing for updates to be easly ported between both addons. Note that there might be bugs on features that were previously working. This will be handled during the next days, as bug reports are received. The option menus have been redesigned. When offline viewing other character items, frames will now layout the items according to the corresponding character settings. Now typing "follower" will browse for follower items on english clients. The "use blizzard frames for disabled bags" feature has not been reimplemented in this version. It should be reimplemeted next version. Swaped behaviour of sort button on Bank. Fixed issue preventing proper stack splitting on right click. Fixed issue causing window to behave strangely when clicking on the "loot won" frame. Fixed issues with item coloring (ex: highlight item sets not working properly). No longer displays warning messages when depositing non-reagents in the Bank or when the reagent Bank is full. No longer causes cursor flickering at vendors. Small changes to prevent tainting issues and extremely rare loading error occurrences. Fixed issue preventing character data from being deleted. Fixed issue preventing proper searches in Korean clients and possibly other localizations. The player dropdown list now displays all your connected realm characters. The new class and race introduced in 6.0.10 should help to keep the list manageable for players with many characters. Tooltips still only display players from the same faction (to keep tooltip sizes manageable) as only BOA accounts are sharable between these characters. Fixed issue preventing some servers to be visible in others. Fixed issue causing Guild Bank tabs sometimes to stay invisible. Ignoring bags for auto sort. Setting bags to a specific type of loot. The sort confirmation dialog was removed. To avoid unwanted sorts, the Bank frame now performs a bulk deposit on left click, and a sort on right click. You may also set bags to be ignored for sorting. Bags now display the number of empy slots available. Reagents now take priority in going to the reagent Bank before other bag slots when depositing. Fixed issue that could be fired when configuring other addons. Now the player dropdown list displays class colors and race icons. This should make it much easier to find players in long lists. Now new item glow flashes for a limited period of time. It remains with a bolder glow than regular items until the bag is closed or the item moused over. Now only characters from the same faction as yours will be displayed in the character list. You must login again in your characters so that BagBrother can learn their factions! Reverse slot ordering option is now working properly. Tip: you can use this option if you prefer to sort items to the bottom of the window instead of the top. To avoid sorting bags by accident, now auto sort displays a confirmation dialog before sorting. Items are no longer marked as new after the bag is closed. Made items in void storage movable. Tooltips now properly display in the void storage. Items in the Bank reagents slot are now properly accounted on item tooltips. Fixed Guild Bank issues, including long-standing log frame problems. Fixed bug causing tooltips not to appear on the reagents Bank slot. Fixed issue preventing Bank slots from being purchased. Fixed errors with player listing. The long awaited feature is finally here! 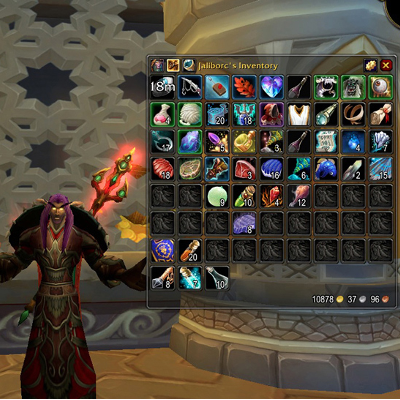 Now there is a new button at the inventory and Bank windows where you can click to automatically sort your items. The button can be disabled at the interface options. But why would you? You can now right-click on the new sort button do deposit all reagents. Now properly displays whether the reagent Bank has been unlocked when offline browsing. Now supports the new void tab! Fixed several issues with the withdraw and deposit interfaces. Updated for Warlords of Draenor. Now supports the new reagent Bank, which appears as a new bag in the Bank window. To deposit all reagents, click on the reagent Bank icon. Now flashes new items, much alike Diablo 3 style. Fixed issue causing errors when opening the Guild Bank for the first time. Hopefully solved tainting issues when opening the inventory for the first time in combat. Now can change Guild Bank tabs while in offline mode. Guild Bank items now show tooltips in offline mode. Many offline Guild Bank issues solved. Added experimental offline Guild Bank support! Solved issue affecting some clients with specific system settings. Solved bug with the layer slider in the Frame Options. Solved bugs with connected realms support. Solved several bugs in the Interface Options. Solved bug with money frame. Fixed some issues when using operators with the text search. Fixed issue causing caged pets quality to not always be properly identified. Fixed issue causing flash find to not work on all items. Fixed bug with Guild Bank and void storage. Added support for the new in-game store features. Hotfix of issue on upload system. Flash Find is back, behaving exacty as on previous patches! Yet, it now uses a different animation system, as the previous one could lead to taints in combat. Alt-clicking an item link in the chat now automatically opens the inventory and searches for the selected item. Fixed issue with the settings version upgrade system. Flash Find now behaves like standard text search. Search bars react accordingly. Fixed bug causing error message on rare login situations. Fixed issue causing some cached item icons to not be properly displayed. Closing the Bank window now properly releases the Banker. Fixed an issue causing caged pets to not be properly displayed in offline mode. Added caged pet tooltip support for the Guild Bank. Added option to color items belonging to equipment sets. Packed with ItemRack and Wardrobe support! Idea and initial prototype by Omee - Proudmoore (US). Reduced chance of tainting issues with popup dialogs. Fixed bug with option to close inventory when leaving vendor. Added support for cooking bags. The realm money tooltip now displays class colors. Bagnon is now fully localized in French (by Noaah) and Russian (by Vgorishny). Fixed bug causing item icons to not always display. Offline view of caged pets is now supported. For now, disabled support for Armory and Baggins caching systems. Very few players use them, were costly yo maintain, and made bug reports harder to decipher. Fixed bug causing Guild money display to behave incorrectly for users with no withdraw limit. Fixed bug causing void storage purchase dialog to sometimes show up when vewing void storage offline. Fixed error causing "Failed to load void storage items." message to show up. Fixed bug causing tooltips to now show for cached void storage items. Updated for compatibility with latest Scrap version. Updated and tested for Mists of Pandaria. Added monk class and pandaren race. Bug fixes and internal improvements. Now tooltip counts can be enabled with BagBrother disabled. Added option to show inventory while socketing items. Fixed a bug causing weird behavior when the void storage was configured while transferring items. After asking the mafia for money, Bagnon was able to buy a Void Storage support for itself, packed up with offline viewing capabilities. Many tweaks and improvements were made to bring you this piece of joy and get the mafia approval. Enabled search tags that were disabled for unknown reasons. Updated LibItemCache - fixes a bug causing money to not be correctly tracked with BagSync. Jaliborc: No more "Jaliborc:" tag from now on. If no tag is here, it means it was me. Jaliborc: With the new cache approach, Bagnon_Tooltips is no more. Now you can toggle the feature at the Interface Options. Jaliborc: Zip file appears to have been corrupted by unknown reason. New attempt to upload. Jaliborc: Implemented options for hiding frames when entering combat/entering a vehicle. Tuller: Fixed missing undead portraits. Tuller: Hearthstones should now no longer have tooltip counts. Jaliborc: Added unsuable item highlighting as an option. Removed ammo + shard color options, since they have no use anymore. Fixed a typo that resulted in a redbox error when hovering over the Guild Bank money frame. Updated LibItemSearch, adding wardrobe support. Added a potential bugfix for the nil frame settings issue. Put a fix in for the withdraw bug. Initial Guild Bank support implemented. Things not supported at the moment: Guild master management & offline viewing. Added a new modifier to search by name: n:search. For example, typing "n:pants" will find all items named "pants"
A search without modifiers, ex "gem" will now perform a smart search, like in 1.x versions of Bagnon. For example, typing "gem" will now find items of type "gem" as well as items named "gem"
Added a keyring bag back to the inventory's bag frame. Its hidden by default. The searching with uppercase text bug should now be fixed. Added new option: Display Blizzard bag frames for disabled bags. Added the ability to right click the title frame to display the options menu. Made the general options panel a sub panel of the main Bagnon panel. This should hopefully make it easier to spot when configuring frames. Added an assertion to catch the nil slot issue, if it exists. Moved item slot event handling to the item frame. Added per frame option: Frame Layer - Controls frames appearing above or below other frames. Rewrote saved settings back end to make it easier for me to adjust defaults. Your settings have been reset. Global settings (stuff on the main options panel) are saved globally. You can now double click to search once again. Started implementaton of the new options menu. Added options for color, border color, columns, spacing, opacity, and scale. I'm calling this version a beta, since I want more feedback. Removed a file that was not being called anymore. Added sounds when opening/closing frames.